Well, here we are only one week away from THE day of eating delicious food, watching tons of football, and giving thanks for the amazing friendships and family that we have in our lives. 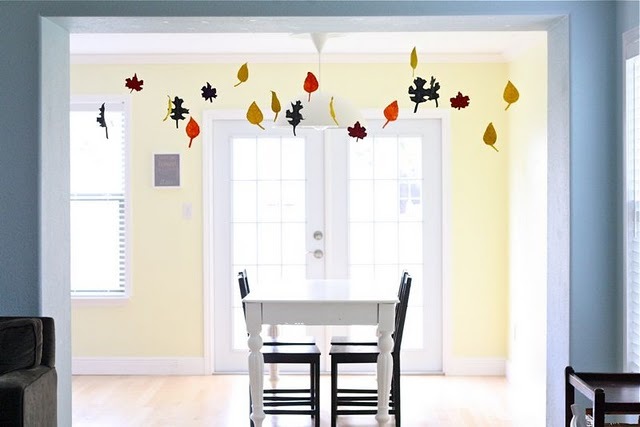 If you're like me, you've been dragging your feet with Thanksgiving decorations (wasn't it JUST Halloween not long ago? 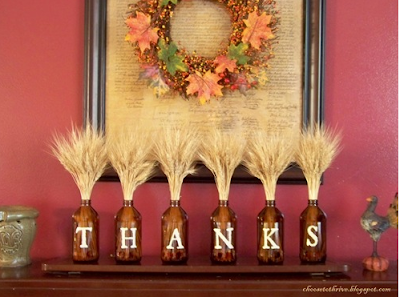 ), so I thought for today's Thrifty Thursday post I'd scrape together some amazing DIY ideas. As you can see, they're great for hanging, scattering on a table, on putting on sticks for a festive bouquet! Click here for the tutorial. 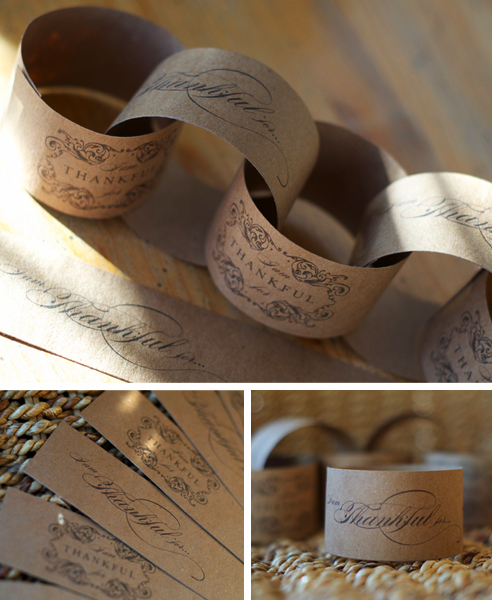 Here you print out strips onto some craft paper, and each one has space for you and your family and/or guests to write down what you're thankful for. Great idea! Click here to get to the site, where you can download the design. 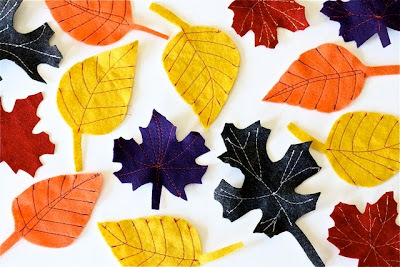 This is a great idea that I've seen done on various blogs with many kinds of leaves. Just collect what you can in your yard (or your neighbor's!) 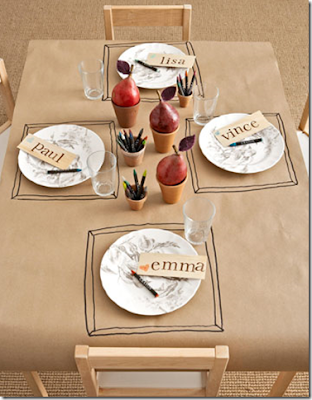 and write guests' names with a metallic paint pen. I really, really love this idea, because it's so inexpensive to do! 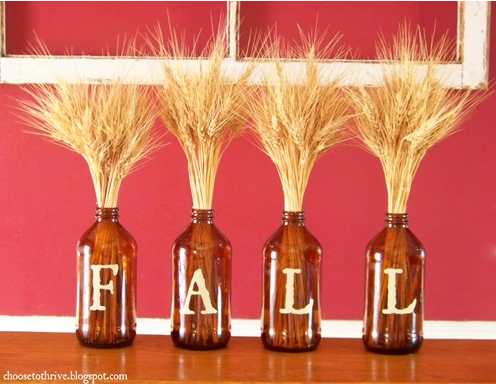 The bottles are former drinks with the labels peeled off, then stencil the letters on the there with a paint pen, and fill with bunches of wheat (which cost practically nothing at grocery stores, or free if you happen to live in the country!). Click here for the tutorial. Now, most people will say this is a great idea for the kids' table (and it is), but as someone who loves to scribble random drawings, I would love to sit at a table like this for Thanksgiving. 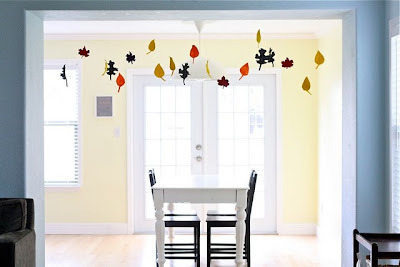 All you need is some brown craft paper, cups to hold colored pencils (and pears if decoration), and then draw squares around the plates to create a "placemat" (I think that's my favorite thing about this idea). Then when all is said and done, you can just crumple up the paper and put it in recycling. 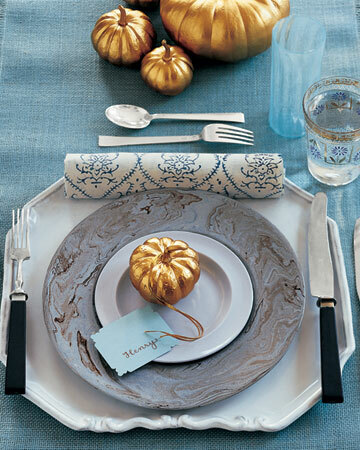 This is also a great and inexpensive idea, especially if you still have some mini pumpkins left over from Halloween. 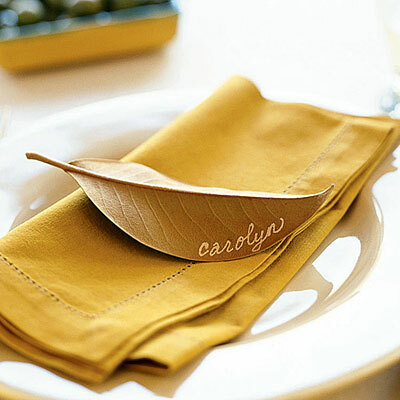 Just paint them gold and tie a hand-written card around the stem to help guests find their seat. Oh Martha, always so thrifty. Click here to check out her tutorial. Hopefully this has got your creative juices flowing! Thanksgiving is such a great holiday for decorations because you can use so much nature in it, making it super thrifty. 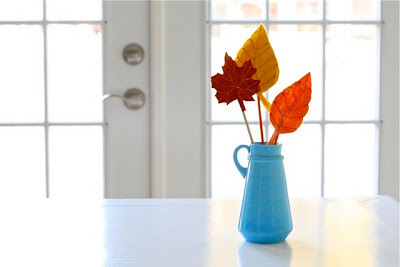 Even grabbing some fallen branches of colorful leaves and sticking them in a vase is better than nothing!